JUBA, South Sudan – Since the re-taking of the disputed area of Heglig by the South Sudan army last Monday, a move that has dramatically escalated hostilities between Sudan and South Sudan, the military situation has been marked by flare-ups along the North-South border and constant bombings of South Sudan by Sudan. Sudan first lost control of the strategic oil site in late March, when South Sudan forces took control of the region—in what southern officials said was a defensive move—and withdrew. The South once again described return to Heglig last week as a self-defensive move. In both instances, both sides have blamed the other for instigating the violence. Now the expectation is that a large counter-offensive by Sudan into Heglig could begin at any moment. There are worrying indications that the front line may expand to beyond the immediate Heglig-Unity region where fighting and bombing have thus far been concentrated. According to South Sudan’s spokesperson, South Sudan and Sudan forces clashed Monday on the western side of the North-South border, when Sudan forces attempted to enter Western Bahr El Ghazal. Skirmishes were reported toward the eastern side of the border, in Upper Nile state on Sunday, between South Sudan forces and militias suspected of receiving support from Khartoum. The Sudan government reported today new clashes on the western side of the North-South border. 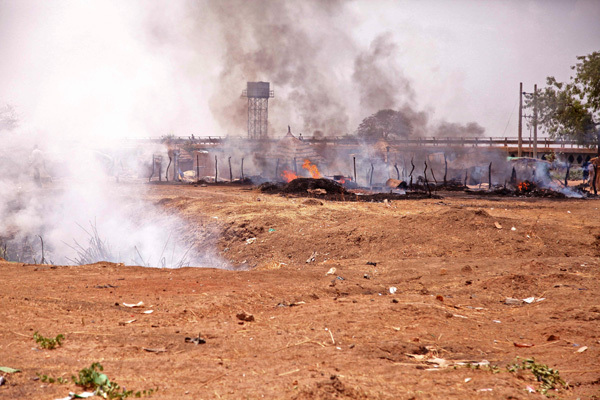 Bombings by Sudan continued throughout the weekend, likely aimed at destroying a number of strategic bridges necessary for southern reinforcements. Alarmingly, southern officials also reported that a Sudan Armed Forces Antonov flew over the capital of South Sudan, Juba, around 10 p.m. on Friday. Juba residents reported hearing a plane, but no other corroborations are possible. Khartoum denied the allegation. In the flashpoint region of Abyei, tensions ran high following the taking of Heglig by the South. President Kiir suggested that should northern forces remain in the Abyei area—in contravention of an agreement signed last year—southern forces may also return to the disputed area. Last Friday, internationals on the ground confirmed that several hundred SPLA soldiers were seen inside Abyei’s borders. According to Enough sources on the ground, forces have begun to withdraw as a result of negotiations between the U.N. peacekeeping mission there and southern officials. In Juba, the seizure of Heglig, an area key to Sudan’s economy, appears to be a popular decision. Members of the South Sudanese parliament responded enthusiastically with applause and chants of “SPLA Oye!” in response to President Salva Kiir’s announcement last Thursday that the army would not withdraw from the area until a “mechanism” is put into place to ensure that the strategic site would not be used to launch future attacks into the South by the North. The South has suggested deploying a U.N. peacekeeping force into the disputed area. The following day, several hundred South Sudanese took to the streets, waving signs and chanting, in support of the president’s decision. With momentum in South Sudan in favor of the government’s bold decision, international calls for an unconditional withdrawal may be a difficult political move for the Juba leadership to make.